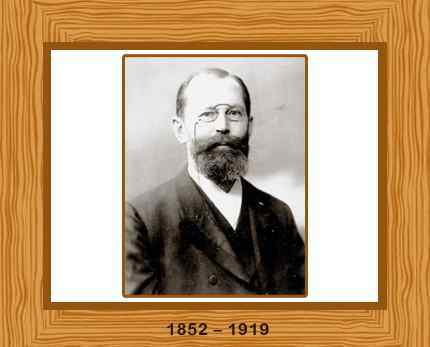 Emil Hermann Fischer, more commonly known as Emil Fischer, was an eminent German organic chemist. He received the 1902 Nobel Prize for Chemistry for his influential research regarding purines and sugars. Born in Euskirchen near Bonn, Germany on 9th October in 1852, Emil Fischer’s father, Lorenz Fischer, was a local businessman who initially wanted his son to follow in his footsteps. Quickly realizing that his son had no grasp of business, his father then encouraged Emil to study chemistry. Fischer started attending the University at Bonn in 1871, where took the classes of Rudolf Clausius and August Kekule. In 1872, together with his cousin Otto Fischer, he moved to the University of Strasbourg and studied chemistry under Adolph von Baeyer. He earned his doctorate in 1874, his doctoral thesis concerning the chemistry of dyestuffs and colors. Fischer stayed on at Strasbourg, working as a research assistant for Bayer. In 1875, Fischer discovered the first hydrazine derivative compound, phenylhydrazine. He also synthesized many other derivatives of hydrazine that would later become useful in the dye making industry. Fischer followed Baeyer to Munich in 1875 as an assistant, becoming a Privatdozent (unpaid lecturer) in 1878, and an assistant professor in 1879. During his time in Munich Fischer continued his research on hydrazines. Together with his cousin Otto, Fisher demonstrated that rosaniline and related dyes were derivatives of triphenylmethane. Three years later, having now a reputation as an excellent organic chemist, Fischer accepted the position of Professor and Director of the Chemistry Institute at Erlangen in 1882, later accepting a similar position in Würzburg in 1885. During this time, Fischer began his research on the active constituents of tea, coffee and cocoa (caffeine and theobromine). His research led him to realize that many vegetable substances all belonged to one family group. He gave the name purines to these compounds, which had a base containing nitrogen and a bicyclic structure. He successfully synthesized several purines including caffeine in 1895 and uric acid in 1897. He suggested formulas for the purines uric acid, caffeine, theobromine, xanthine and guanine. In addition to purines, Fisher also researched the known sugars and he established the stereochemical nature and isometry of these sugars. He synthesized glucose, fructose and mannose in 1890 starting from the substance glycerol. Fischer became the successor to A. W. von Hofmann, as director of the Chemistry Institute of Berlin in 1892, a position he kept until his death. Between 1899 and 1908 he studied proteins and enzymes. He established the important “Lock and Key Model” for the visualization of the substrate and enzyme interaction. He formulated that amino acids, which are the building blocks of proteins, are joined together by “peptide bonds”. He also devised a method of combining amino acids to form proteins known as peptides. He married Agnes Gerlach in 1888 and they had three sons; two of whom became medical doctors and died as soldiers during World War I. Hermann Fischer, his third son, became a famous biochemist. He was awarded the Nobel Prize for Chemistry in 1902 for his work on sugars and the purines. He was influential in establishing the Kaiser Wilhelm Institutes in 1911, now called the Max Planck Institutes. Fischer died in Berlin on July 15, 1919 shortly after being diagnosed with cancer. He was 66 years old.